The efficient artist will appreciate the Studio Designs Futura Craft Station with Glass Top. 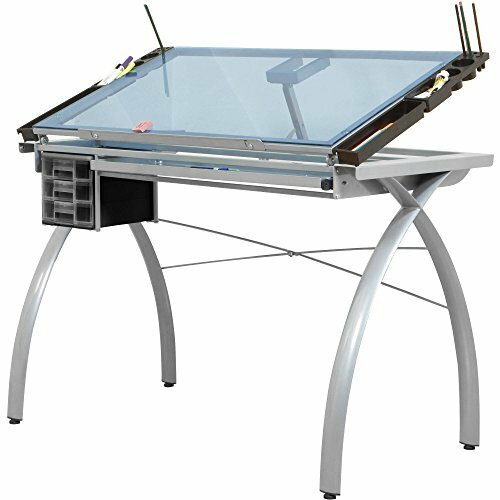 Constructed of durable heavy gauge steel, this sleek, contemporary-style craft/drafting table features a tempered blue safety glass work surface, which measures 38W x 24D inches. The surface tilts at an angle of up to 35 degrees for comfort while working. Simply add a light source beneath the glass work surface, and you've got yourself a tracing table as well. This table is also compatible with parallel bars (not included) up to 36 inches in length. There are two styles of detachable side trays that come with the drafting table (2 art trays and 2 pencil trays). Each art tray features a large compartment (4.5L x 2.125W x 1.375D inches), 2 large circles (1.375D x 2.25 diam. in. ), and 6 small pencil holes (1.375D x .375 diam. in.). Each pencil tray measures 12L x 2.5W x 1.375D inches and is ideal for holding small supplies. This table also includes a detachable plastic 3-drawer storage unit, as well as a 28L x 10W inch slide-out pencil drawer and a 24 inch slide-up pencil ledge that keeps tools from rolling away. Four floor levelers let you create a stable, even work surface on uneven flooring. This table measures 43W x 24D x 31.5H inches and requires some assembly. If you have any questions about this product by Studio-Designs, contact us by completing and submitting the form below. If you are looking for a specif part number, please include it with your message.